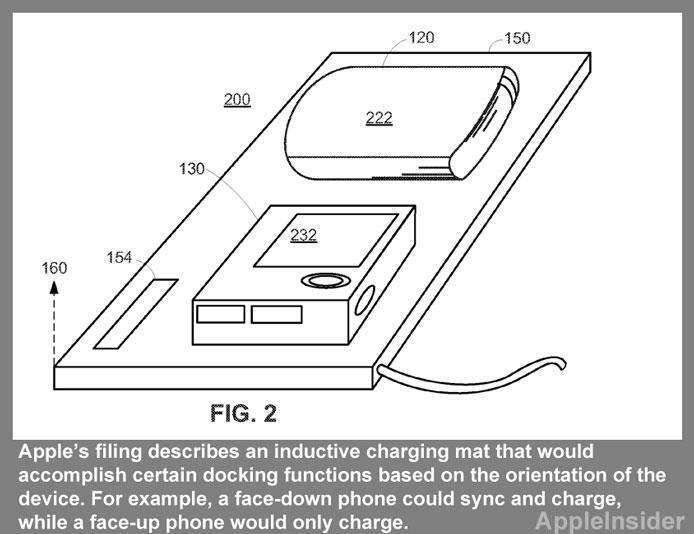 Apple has shown interest in building an inductive charging mat that would allow users to dock, charge and sync their portable devices by simply placing them on top of the accessory. 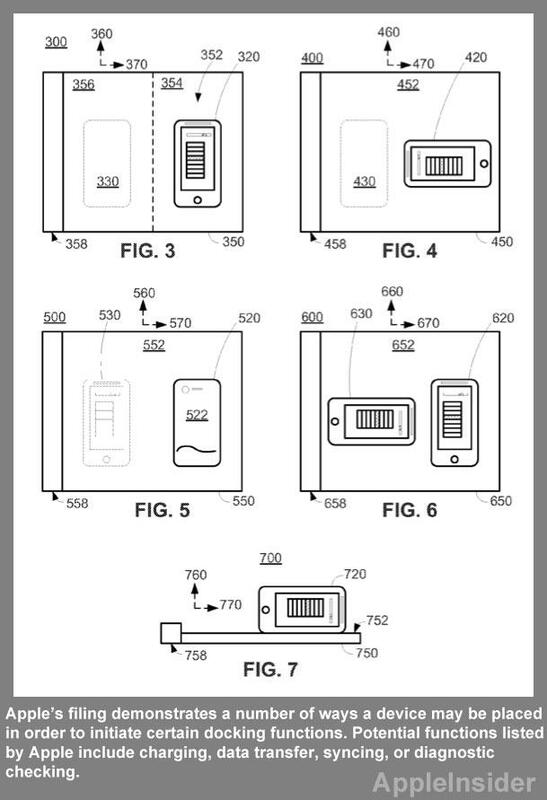 The details come from a newly published Apple patent application discovered on Thursday by AppleInsider. The filing, entitled "Device Orientation Based Docking Functions," describes a "docking device" that would allow devices to be placed on top of it. The mat would accomplish docking functions such as charging, data transfer, syncing, diagnostic checking, or any other potential use based on the physical orientation of the user device on the surface. The filing notes that smartphones, like the iPhone, as well as digital cameras and media players like iPods can all be built to utilize inductive charging surfaces. Circuitry in these devices would respond to a magnetic field provided by the charging surface that would also allow data to be transferred while the device is docked. While inductive charging surfaces are not new technology, Apple's application brings a new twist to the concept with the idea of interpreting the device's orientation for specific purposes. For example, a future iPhone with inductive charging capabilities could be placed face down on the mat for charging only, while placing the handset face-up on the mat could initiate syncing with a computer or iCloud as well as charging. Once a device is placed on the mat, its current docking mode may be indicated to the user by either a sound, a graphic displayed on the device's screen, an electronic message notification, or a vibration of the device. Beyond a local computer for syncing, the inductive charging mat could also be connected to a host of devices throughout a person's home. In one example, the mat is connected to speakers for audio output when docked. 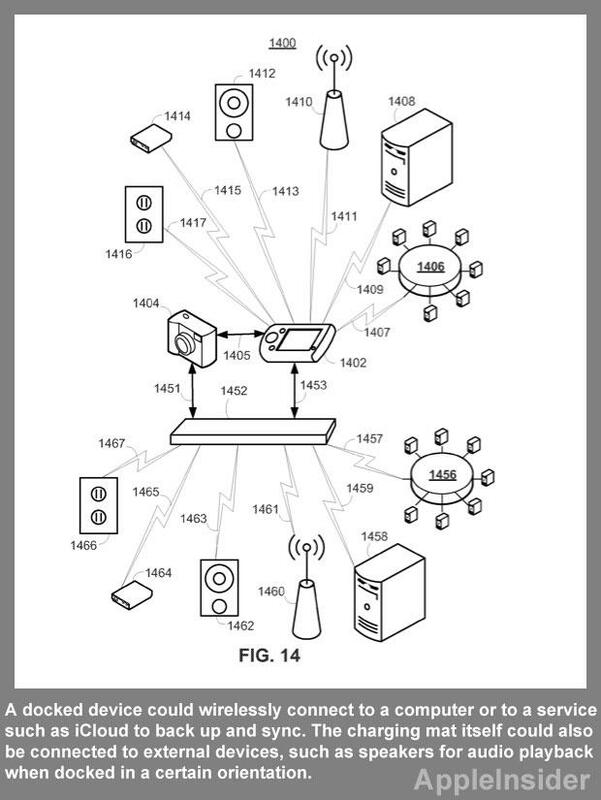 Apple's proposed invention was first filed with the U.S. Patent and Trademark Office in March of 2011. It is credited to Jorge S. Fino. When the iPhone 5 was announced earlier this month, Apple's marketing chief Phil Schiller was asked why the new handset does not include inductive charging capabilities. He said the perceived convenience of such technology is questionable, as charging mats must still be plugged into an outlet. "Having to create another device you have to plug into the wall is actually, for most situations, more complicated," he explained.